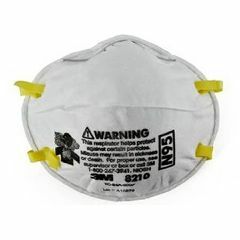 AllegroMedical.com presents The 3M N95 Particulate Respirator Mask with Ear Loops. The lightweight, disposable N95 particulate respirator is designed to help provide quality, reliable worker respiratory protection. 3M uses a variety of innovative features to help you meet your respiratory protection and comfort needs. The respirator incorporates 3M's proprietary technology with advanced electrostatically charged microfiber filter media. Adjustable noseclip reduces potential for eyewear fogging and helps ensure a better seal and fit. Two-strap design with welded dual point attachment helps provide a secure fit. Can also be used to help reduce inhalation of certain airborne biological particles like mold, Bacillus anthracis, Mycobacterium tuberculosis, etc. Example applications include emergency or pandemic preparedness planning, stockpiling, etc. These N95 Masks are great for Ebola, MERS, Flu and other airborne virus protection. These N95 Masks block alpha particles and low-energy beta particles from entering your system. Ebola hemorrhagic fever is a severe and often deadly illness that can occur in the human body. Health organizations recommend to avoid areas in which there are epidemics. For full protection its ideal to wear a gown, gloves, and mask around sick patients. These precautions will greatly decrease the risk of transmission. Wonderful service and very speedy delivery.